Wow! Where did the week go? $350.oo later, my computer is back. I am way behind. But I’ll not fret. It’s the weekend AND hubby’s weekend OFF. Have a great one, my friends. Here are a few pics from the week. Baby~ caught in the act. This entry was posted in Dogs, photos, Uncategorized and tagged broken computer, decorated tornado helmet, Dogs destroy ball, tornado hat, Workweek and weekend. Bookmark the permalink. Especially love your helmet – the peace symbol is very fitting for you! Have a great weekend (we need to catch up one of these days)! Glad you didn’t get blown away! Have a beautiful, blessed, blogging weekend!!! Very nice his ‘n’ her headwear! 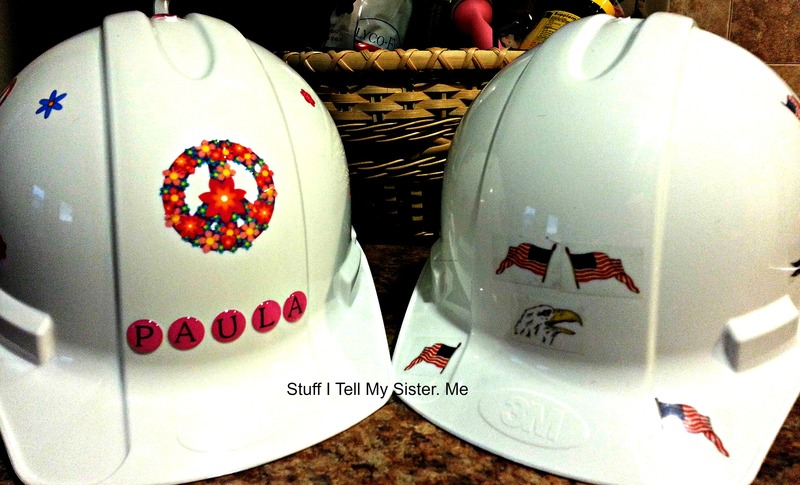 I love your hard hat too! White is a supervisor’s hard hat right? Haha! That is too cute. She might be an actress then. She looks so convincing! Oh that is so good to know! Thanks! I needed a new hard drive. Then he did my backup onto an external hard drive as well. Added Norton. And stuff…..lol Sadly…I have NO IDEA on any computer stuff. I was simply going to go buy a new computer and he said the computer would be good for a long while with this fix. I sure hope so…. I’ll get back with you on that one! Oh, I need a peace sign helmet, I can wear it while I blog! 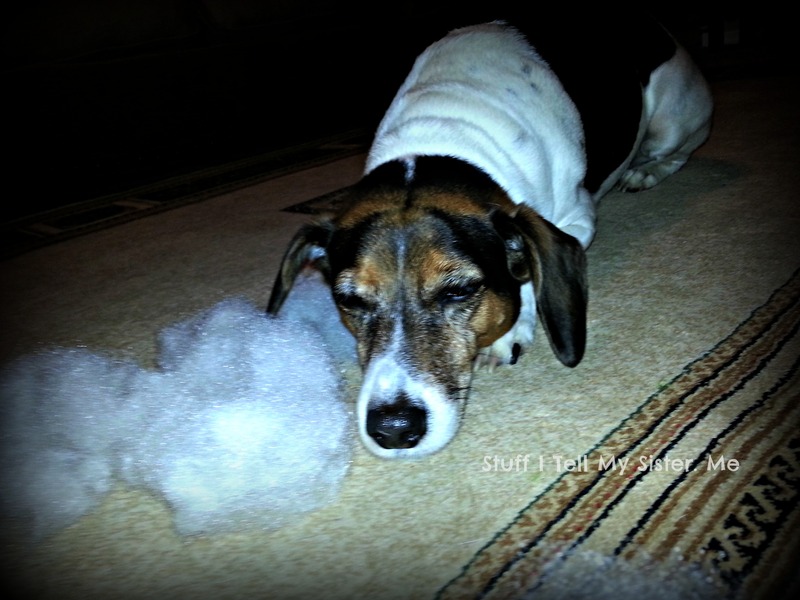 My dog will tear up a toy almost as fast as I give it to her. 😉 everybody needs one! lol! Our dogs are really good. 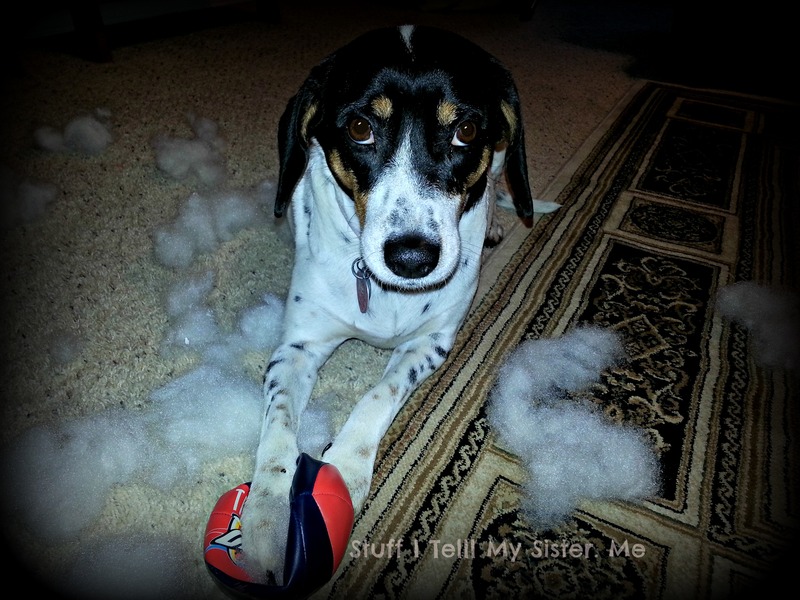 They only destroy their toys….never our stuff. I don’t know how they know….but they do! I hope you are off somewhere on one of your adventures:-) And…cloud backup, piece of cake…do it. We started out this morning and the rain drove us back home….getting ready to try it again in a few as the sun is trying to peak thru. And when you said “Cloud”….I thought you meant CLOUD! lol! More confusion in the English language …now “cloud ” has a new definition:-) I just received an email from Amazon saying that I have 18 albums of music (I have purchased over the years) available for free download from my Cloud account! Technology life is good these days:-) I shall add them to my phone and tablet so easily. 😉 Always an American flag for him! Baby and Sugar!! LOL!! The look on Baby’s face is priceless. Great job on the helmets, and I hope you never have to use them. Thanks….I’m with you on never using them! Glad to see your back up! Hey, I wear a very similar hard hat!